Aim of the study: This study aims to correlate the relationship of retinopathy of prematurity (ROP) with anemia in premature infants with regard to incidence and progression of ROP. Materials and Methods: All high-risk infants from our institution and neighboring districts as selected by neonatologist were screened at Special newborn care unit every Thursday on regular basis, and this study includes infants screened at ROP clinic during January 2017–March 2017. Conclusion: In our study at ROP clinic, high-risk premature infants who were screened showed a significant prevalence of ROP in babies weighing <2.000 kg and with female preponderance. The role of anemia and other neonatal risk factors needs to be evaluated further in our ongoing study. Retinopathy of prematurity (ROP) is a disease affecting the retina of premature infants. ROP is unique in that, this vascular disease is found only in infants with immature, incompletely vascularised retina, hence its connection with premature birth. Induced hyperoxia caused downregulation of vascular endothelial growth factor (VEGF) and death of endothelial cells, suggesting that VEGF is an endothelial survival factor. In the time that follows the closure of these growing vessels, the differentiating retina becomes increasingly ischemic and hypoxic, and VEGF is upregulated during the neovascularization. In general prematurity, low birth weight and prolonged supplemental oxygen are established factors for the development of ROP. Hence, a study was conducted in ROP clinic to correlate the relationship of ROP with anemia in premature infants with regard to the incidence and progression of ROP. All high-risk premature infants from our institute and neighboring districts as selected by the neonatologist were screened at ROP clinic on regular basis since 2015, and this study includes infants evaluated during January 2017–March 2017. 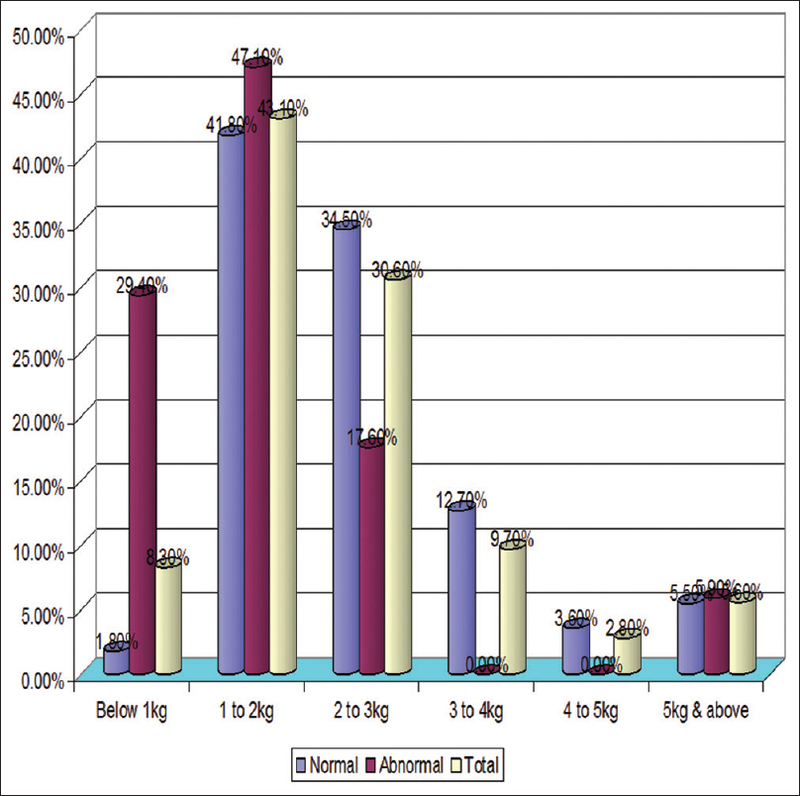 Indices included for this study are gestational age, chronological age, birth weight, gender, referral district, staging of ROP, and hemoglobin levels. Infants were dilated with tropicamide every 15 min for three times, and the fundus examination was carried out at Neonatal Intensive Care Unit. Using wire speculum after instillation of topical anesthetics, fundus examination was done using binocular indirect ophthalmoscope and with scleral indentation. All details were recorded in the ROP chart [Table 1] and [Figure 1]. A total of 72 infants were screened in our study. Most of the infants were found to be between 30 and 60 days of birth (40.5%) and below 30 days were of 36.1% [Table 2], [Table 3] and [Figure 2]. 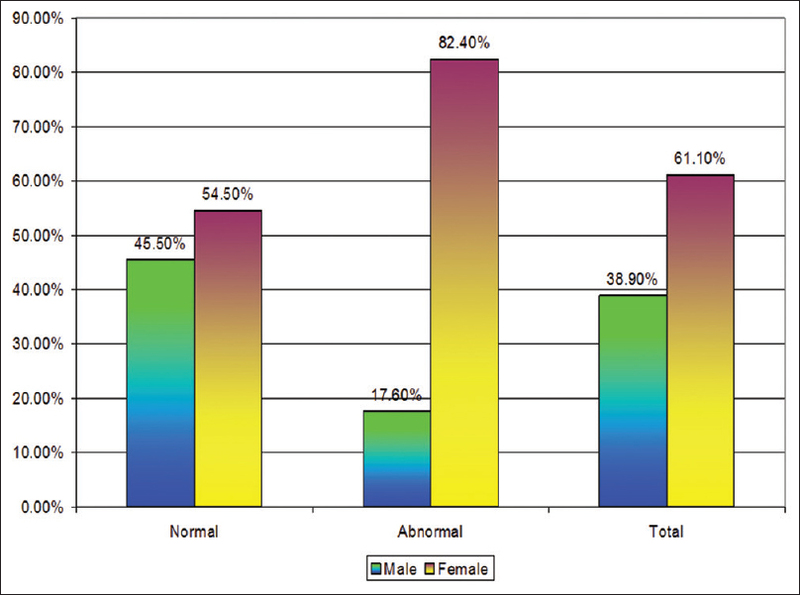 Affected group was more of female gender population [Table 4]. 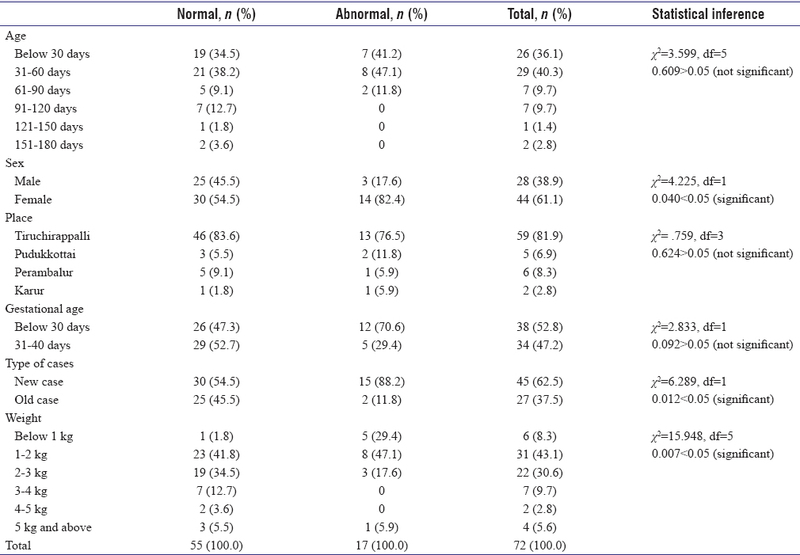 There was no marked difference in respondents between <28 weeks of gestational age and above 28 weeks [Table 5]. Most of affected infants were in 1–2 kg group (43.1%), i.e., 31 infants and 2.3 kg (30.6%), i.e. 22 infants [Table 6]. The hemoglobin level was not much variable in both normal and affected premature infants with statistical inference of 0.834>0.05. And was insignificant [Table 7] and [Table 8]. Alon T, Hemo I, Itin A, Pe'er J, Stone J, Keshet E, et al. Vascular endothelial growth factor acts as a survival factor for newly formed retinal vessels and has implications for retinopathy of prematurity. Nat Med 1995;1:1024-8. Hellstrom A, Perruzzi C, Ju M, Engstrom E, Hard AL, Liu JL, et al. Low IGF-I suppresses VEGF-survival signaling in retinal endothelial cells: Direct correlation with clinical retinopathy of prematurity. Proc Natl Acad Sci U S A 2001;98:5804-8. Liu PM, Fang PC, Huang CB, Kou HK, Chung MY, Yang YH, et al. Risk factors of retinopathy of prematurity in premature infants weighing less than 1600 g. Am J Perinatol 2005;22:115-20. Maheshwari R, Kumar H, Paul VK, Singh M, Deorari AK, Tiwari HK, et al. Incidence and risk factors of retinopathy of prematurity in a tertiary care newborn unit in new Delhi. Natl Med J India 1996;9:211-4. Fierson WM; American Academy of Pediatrics Section on Ophthalmology; American Academy of Ophthalmology; American Association for Pediatric Ophthalmology and Strabismus; American Association of Certified Orthoptists. Screening examination of premature infants for retinopathy of prematurity. Pediatrics 2013;131:189-95. Fortes Filho JB, Eckert GU, Valiatti FB, Dos Santos PG, da Costa MC, Procianoy RS, et al. The influence of gestational age on the dynamic behavior of other risk factors associated with retinopathy of prematurity (ROP). Graefes Arch Clin Exp Ophthalmol 2010;248:893-900. Gibson DL, Sheps SB, Uh SH, Schechter MT, McCormick AQ. Retinopathy of prematurity-induced blindness: Birth weight-specific survival and the new epidemic. Pediatrics 1990;86:405-12. Gilbert C, Rahi J, Eckstein M, O'Sullivan J, Foster A. Retinopathy of prematurity in middle-income countries. Lancet 1997;350:12-4. Englert JA, Saunders RA, Purohit D, Hulsey TC, Ebeling M. The effect of anemia on retinopathy of prematurity in extremely low birth weight infants. J Perinatol 2001;21:21-6.